Versailles FFA members (l-r) Deanna Hesson, Laura Wuebker, Cayla Batten, Ian Gehret, Franklin Shimp, Abby Petitjean and Jack Barga helped clean and organize the Ronald McDonald House after they dropped off blankets and extra toys from a toy drive. 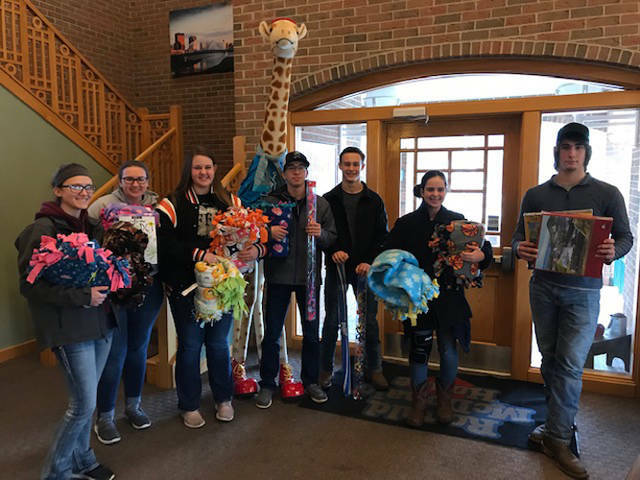 Versailles FFA members who brought toys to the Dayton Children’s Hospital included (l-r) Deanna Hesson, Jack Barga, Franklin Shimp, Ian Gehret, Abby Petitjean, Cayla Batten and Laura Wuebker. 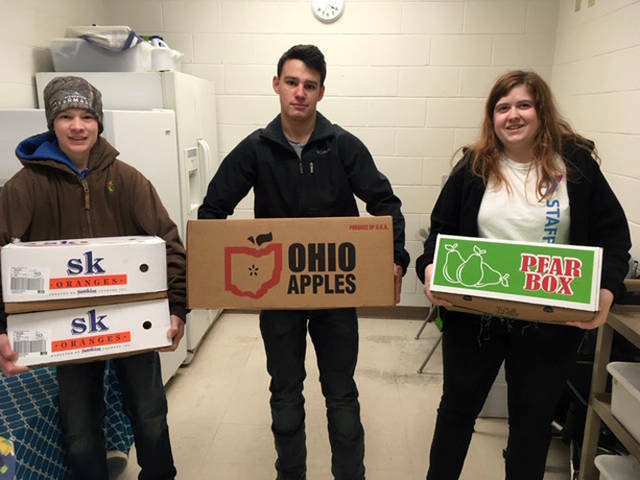 Corey Timmerman (left) and Chad Shimp (right) delivered extra FFA fruit to the Versailles YMCA as a part of spreading community service cheer. The Versailles FFA sponsored a family for Christmas, and FFA members helped with delivering the gifts. Members pictured include (front row, l-r) Noah Barga, Taylor Cordonnier, Shelbie Schmitmeyer, Kayla Bohman, Renea Schmitmeyer, Breanna Nieport, Lauren Sherman, Sarah Hess, (back row, l-r) Elliot George, Sam Bensman, Tyler Gigandet, Wes Gehret, Luke Billenstein, Kimberly Winner, Jack Gehret and Nicholas Didier. Versailles FFA members (l-r) Franklin Shimp, Kristopher Marshall, Dylan Meyer, Greg Dircksen, Anna Barlage and Laura Wuebker assisted in dropping off fruit and toys to the council of churches for the annual toy distribution. 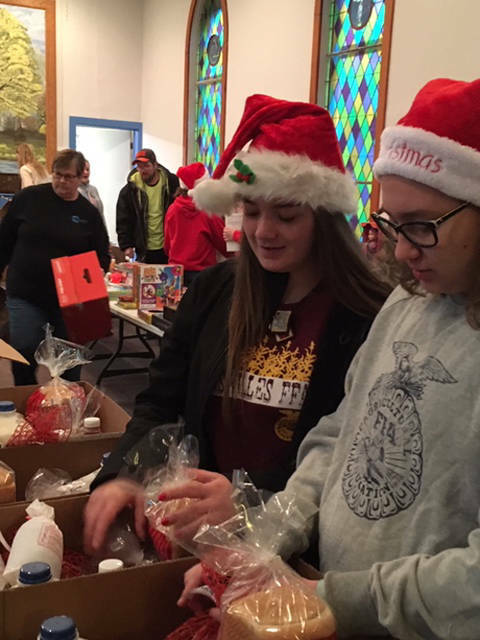 Versailles FFA members Laura Wuebker (left) and Tori Wuebker (right) assisted in packaging the food boxes that were distributed at the toy drive with the Council of Churches. 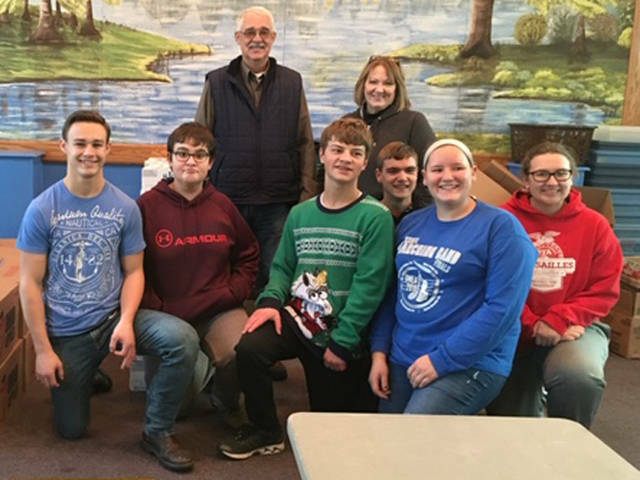 The Versailles FFA assisted the Council of Churches in distributing food supplies and toys during the Christmas toy distribution. Pictured are (front row, l-r) Anna Barlage, Tyler Dirksen, Haley Smith, Maddy Henry, (back row, l-r) Austin Spradlin, Zach Watren, Taylor Bergman, Laura Wuebker, Caden Buschur and Jacob Wuebker. Versailles FFA members (l-r) Courtney Batten, Grace McEldowney and Marcus Berger assisted with delivering and assisting with the toy distribution at the Council of Churches. 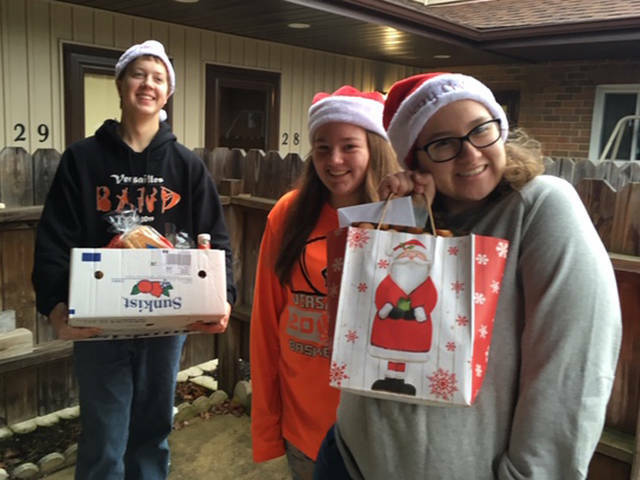 Versailles FFA members (l-r) Tyler Dirksen, Haley Smith and Laura Wuebker personally delivered care packages throughout Versailles to spread Christmas cheer. 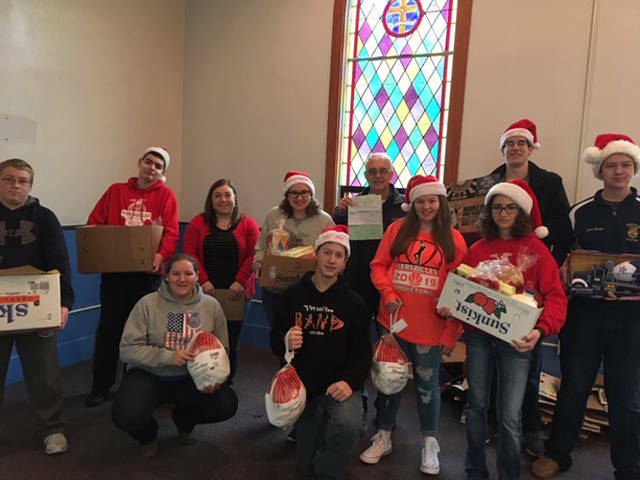 VERSAILLES – Members of the Versailles FFA have been extremely busy in recent months spreading the spirit of community service. Versailles FFA delivered boxes of fruit to Versailles Kinder Corner, the Versailles YMCA, the nursing home and Brilliant Beginnings. It also delivered boxes of toys and blankets to the Ronald McDonald House, Dayton Children’s Hospital and St. Vincent DePaul. 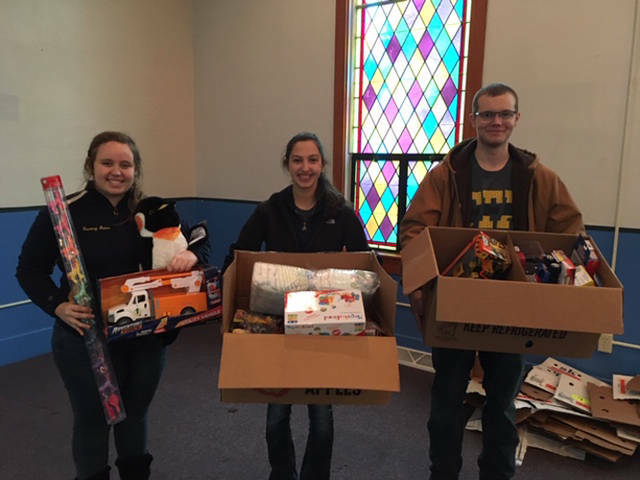 In December, Versailles FFA conducted a toy drive collection with new toys distributed through the Versailles Council of Churches. More than 4,000 toys were collected and distributed to the families that participated in the Versailles Council of Churches. A check for more than $1,400 was given to the Council of Churches, which included canned food drive money. Additional toys were delivered to Rustic Hope and Dayton Children’s Hospital. The Versailles FFA also was given a donation to create food boxes that were distributed at the Toy Drive Distribution. The boxes included foods such as milk, bread, eggs, ketchup, butter, cheese, barbecue sauce, a can of beef and pork, hamburger and potatoes. Johns IGA, Winners Meats and Werlings and Sons helped secure the food for these boxes. FFA members who assisted in packing these boxes included Laura Wuebker and Tori Wuebker. Donating facilities to use as toy drop off locations were Versailles Saving and Loans, St. Denis Catholic Church, Holy Family Catholic Church, Versailles Christian Church, Trinity Lutheran Church, Versailles United Methodist Church, Webster United Methodist Church, Second National Bank, US Bank, Dollar General, Versailles Ace Hardware, Johns IGA and the Versailles School Cafeteria. Dan Brown and Jenny Parin of the Versailles Council of Churches assisted with the toy distribution. Bill Coomer went shopping and purchasing many toys to benefit the program. 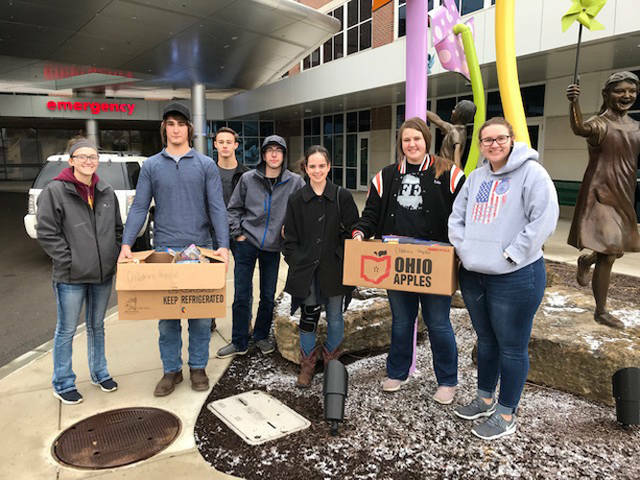 Versailles FFA also had extra toys left after the toy distribution and some of the extra toys were given to Rustic Hope, the Ronald McDonald House and Dayton Children’s Hospital, who will distribute them on a needed basis. The Versailles FFA presented the Versailles Council of Churches with gifts for one family the Versailles FFA adopted. Members of the Versailles FFA who presented the gifts and fruit to the Council of Churches included Franklin Shimp, Kristopher Marshall, Dylan Meyer, Greg Dircksen, Anna Barlage and Laura Wuebker. Versailles FFA members Dylan Meyer, Elise George, Tori Wuebker, Cayla Batten and Emma George went shopping to select the gifts for the family. The Versailles FFA also sponsored a can food drive the last week of school for all junior high and high school students and donated cans to benefit the Versailles Area Food Pantry sponsored through the Versailles Area Council of Churches. This year, the drive was based on averages in homerooms of the middle school and high school. For the high school, around 4,000 cans were donated. Taylor Bergman’s first period class placed fourth with an average of 16.87 cans, and third place was John Jackson’s homeroom with an average of 39.9 cans. Second place was Emily Kremer’s composition class with an average of 57.42 cans, and the winning class was Gregg Niekamp’s first period with an average of 69.83 cans. The middle school collected 1,500 cans, and Laura Davis’ homeroom placed first. The winning class in the middle school and high school will receive a pizza party as a reward. Laura Wuebker, Haley Smith and Tyler Dirksen personally delivered care packages throughout the town of Versailles. The Versailles FFA Community Interactions Committee helped organize the toy drive and canned food drive. Members of the Community Interactions Committee include Luke Billenstein, Noah Barga, Taylor Cordonnier, Kayla Bohman, Kimberly Winner, Nicholas Didier and Tyler Gigandet. On Feb. 18, Cayla Batten, Deanna Hesson, Ian Gehret, Jack Barga, Franklin Shimp, Abby Petitjean and Laura Wuebker traveled to Dayton Children’s, St. Vincent DePaul and the Ronald McDonald House. They delivered approximately 100 toys and 15 handmade blankets to each location, as well as helped with cleaning duties such as vacuuming, sweeping and tidying up the areas.